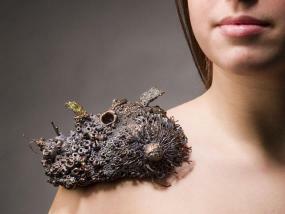 Stephanie Tomczak creates Ocean-inspired jewelry that is wearable art. She hopes people will treasure the jewelry and pass it down as an heirloom for generations. Seattle-based jewelry artist Stephanie Tomczak graduated from the University of the Arts of Philadelphia, PA with a Bachelor of Fine Arts in 2007. An award winning jeweler, Tomczak's work has been shown in curated exhibitions and featured in publications. Stephanie Tomczak designs jewelry inspired by nature and life cycles. Her Oceanic Gems collection captures the beauty of aquatic life and the life cycles in her own artistic interpretation. LoveToKnow (LTK): On your website artist statement, you state that you "create wearable works of art that can be passed down for generations." Please describe your commitment to creating heirloom quality art jewelry. Stephanie Tomczak (ST): When a piece of jewelry becomes an heirloom, its sentiment is often worth more than the materials of which it's made. Metal will last forever and can age beautifully over time, so the quality of craftsmanship is essential to the life of a piece of jewelry. I keep this in mind, whether I am making a one-of-a-kind piece or working on a limited series. Today many people are looking for a deal when it comes to jewelry. I would like for people interested in art jewelry to understand that it is more than an accessory, it is an investment. LTK: Your artist statement says that "living in a mass produced society, it is important to work with your hands." How does this idea inspire your jewelry designs and life in general? ST: Working so closely with my materials helps keep me aware of where they come from and the effects they have on people and the environment. This awareness has also carried over into other parts of my life, from making dinner to going shopping for clothes. I wish I could afford to only buy handmade, local, and fair trade products all of the time. But I do always do my best to be conscious of my options and make informed decisions both in and out of the studio. I believe that simply being aware leads to making ethical choices. LTK: In your artist statement you also say that you "create jewelry that depicts the beauty that I find in growth and decay." Could you give examples of jewelry pieces that depict these ideas? ST: All of my work is inspired by the nature of the life cycle. 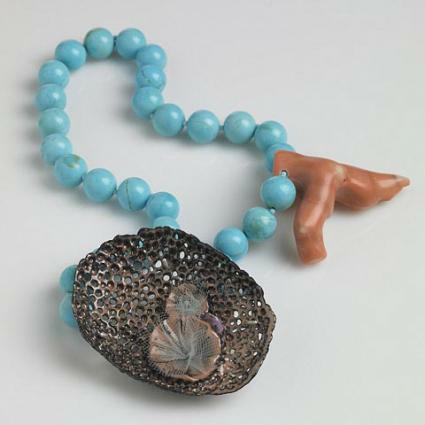 For example, "Necklace 1" (electroformed copper, leaded enamel, turquoise, coral, tulle, and sterling silver) depicts the growth of fictional forms from the deep ocean. While a piece like "Growth" (copper, found objects) blurs the line between blooming and wilting. 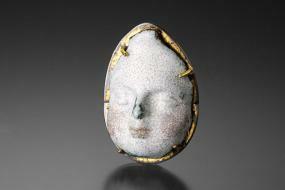 In contrast "Angelito, a Mourning Portrait" (electroformed copper, enamel, sterling silver, 18k gold and gold leaf) directly represents death in a modern interpretation of Victorian mourning jewelry. LTK: What type of jewelry materials do you like to work with?ST: I really love incorporating color into my work, so my favorite materials to work with are often rich in color, such as enamel, polymer clay, turquoise, and coral. But I also like to work with silver, found objects, and wool, and lately I really like using tulle. LTK: What types of jewelry design techniques do you generally use in your craft? ST: Most of my designs start with carving and sculpting, usually in wax, which is then electroplated with copper and enameled for color. But I also carve stones and sculpt polymer clay into elements for my work. Lately, I have been using beading in my jewelry, which is a little ironic for me. I spent the first year of my first jewelry job stringing pearls and beads, and I swore that I would never do it in my own work. I also love fabricating silver, sawing, soldering, and forging. If I am having a crazy day or just need a breather from what I am working on, I love piercing out an intricate design or cold forging a spoon. LTK: Ocean life is the theme in your Oceanic Gems collection. What led to your interest in ocean life and how do you capture it in your jewelry? ST: In recent years, the photography of Roger Steene and the BBC series "Blue Planet" have been a huge inspiration for me. But I have always been drawn to life from other worlds, anything outside of my norm. I wouldn't say that I capture ocean life in my jewelry. I sculpt and carve from my imagination, so all of the forms are fictional but with strong ocean influences. In my Oceanic Gems series, I paired objects that I crafted with elements actually from the sea, in the hopes that I could blur the line of what is "real." LTK: Please describe your favorite or most meaningful jewelry piece that you designed.ST: The piece jewelry that I created that has the most meaning to me was a brooch that I made for my grandmother shortly before she died. She was buried with the brooch and I have a tattoo of the design that I pierced into the silver. So we will both have it with us forever. LTK: What do you hope people will see in your jewelry and feel as they wear it?ST: Mainly I just would like for people to get excited! I have serious convictions about why I make jewelry, and some of my work has deep undertones. But visually I see most of my work as fun and playful. When I see artwork that I really love, the best way that I can describe how I feel is that I that want to eat it like candy. If someone looks at my work and feels that way, I would be honored. LTK: What are your future plans for your jewelry? ST: I always have ideas for what I want to make, but I find that I never really know for sure how it is going to manifest until I sit down at my bench and start making. This fall, I will be teaching an Intro to Jewelry and an Enameling class at North Seattle Community College. I am eager to start teaching because I love sharing my passion with other people. LoveToKnow thanks Stephanie Tomczak for the fascinating interview and wish her great future success in all her endeavors.